U.S. naval forces operating in and around the Strait of Hormuz, a critical shipping lane, are "routinely approached by Iranian warships and aircraft" on a "nearly daily basis," according to a Pentagon official familiar with operations in the region. During these interactions between U.S. and Iranian forces, American aircraft and ships are routinely photographed by the Iranians for intelligence purposes, according to the official, who said that most confrontations between the sides are "conducted in a safe and professional manner." The disclosure of these daily run-ins comes following the release of footage by the Iranian military purporting to show a reconnaissance mission over a U.S. aircraft carrier station in the Strait of Hormuz. The clip, which was filmed at the end of August and is punctuated by dramatic music, shows U.S. personnel aboard the ship and shots of U.S. warplanes stationed on it. Iranian Revolutionary Guard Corps "drones have carried out such missions many times; although the drone remains for a long time above the [American crew’s] heads, they didn’t notice it," Iran’s state-control media reported in Persian at the time, according to a translation by the Middle East Media Research Institute. "In some cases, [the American crew] did notice the IRGC drone awhile after the filming and tried to drive it off by sending a helicopter or fighter jet after it." When asked about the veracity of the clip, a Pentagon official said that Iran conducts surveillance missions on a routine basis. "U.S. 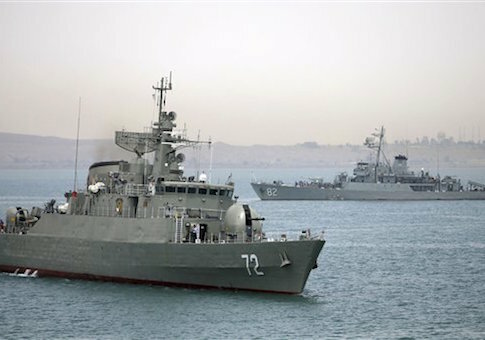 Naval forces are routinely approached by Iranian warships and aircraft as they operate in the region, with the majority of all interaction by the Iranians conducted in a safe and professional manner," the official said. "This happens on a near daily basis." "The Iranians’ primary purpose for approaching U.S. forces is for ISR [Intelligence, Surveillance, and Reconnaissance] so these interactions are almost always characterized by the presence of Iranian photographers capturing photos and video," the official added. The United States also films these encounters, the official noted. "During these interactions we, too, capture imagery for the record," the official said. "Safe, professional, and routine interactions are of no concern, and we are fully confident in the ability of U.S. Naval forces to defend themselves. We also publicly acknowledge those interactions with the Iranians which we consider to be unsafe." These encounters are underscored by violent and threatening rhetoric from senior Iranian officials, who have maintained in recent weeks that despite the recently signed nuclear accord, Iran will not end its support for terrorist proxy groups. These officials have issued threats towards the United States and Israel, saying that the regime continues to work for the destruction of both nations. "I officially declare that under no circumstances will we refrain from providing material and moral support to Hezbollah, or to any group of the resistance to the U.S. and Israel," said Hossein Dehghan, Iran’s defense minister, in an interview this month, according to a translation of his remarks. Iran continues "to consider the U.S. to be the ‘Great Satan’ even after the nuclear deal," Dehghan said.